Tempo Butterfly Series - The perfect shade plant! These gorgeous blooms all have a darker butterfly-shaped center eye that will draw attention to your annual bed or container. Don't use them sparingly. Height: 10 in. Double Impatiens - Impatiens walleriana - Annual; Blooms resemble small roses in various shades. Make wonderful container or bedding plants in the summer and attractive houseplants. Best in partial shade; plant height: 1ft. Victorian Rose - Impatiens walleriana - Annual - AAS Winner with large rosy pink double blooms. Good cascading type, making an excellent hanging basket plant. Shade to partial shade; height: 10in. Jungle Gold - Impatien auricoma - Annual - Bright yellow blooms resemble tiny orchids and are carried above dark green glossy leaves. Perfect plant to lend character to any shady area. Good for bedding and containers. Shade to partial shade; height: 10in. Jewelweed (Orange Jewelweed, Spotted Jewelweed, Spotted Touch-me-Not, Orange Balsam) - Impatiens capensis - Annual - A native American wildflower having orange three petaled blooms and green leaves that take on a silvery sheen in the rain or under water. Jewelweed has been used for centuries to treat skin infected with poison ivy and nettle stings. The leaves, flowers and stems have also been eaten, cooked as a green, but they contain oxalates which may be toxic in large quantities and internal use is currently not recommended This variety does very well on moist, well drained rich soils with a slightly acidic pH. Semi-shade is recommended for best growth. 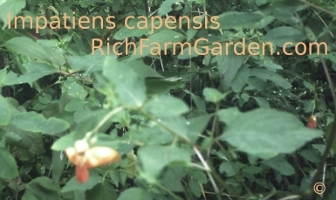 Like garden balsam (Impatiens balsamea), a relative, the seed pods spring open when touched when they are ripe. Have fun trying to collect seed! Easily propagated by summer collected seed planted the following spring. The best treatment for Poison ivy is to not get near it. So teach the kids to recognize it. But we wear shorts and short sleeves, and miss the vegetation in the mix. Skin reactions to contact with thistle, ragweed, poison ivy and oak are common. The first order of business is to wash skin that made contact. The saps from these plants are oily, so use a good soap and scrub thoroughly, but with cold water the first round. 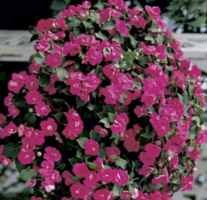 Next, thoroughly dry, and then apply a light oil, such as cooking oil or light mineral oil with crushed stems from the Impatiens capensis plant. Rub this around thoroughly. (A prepared infusion is handy, but if you have the plant, it will be ready when the Poison Ivy is.) Then use a mechanic's hand cleaner or degreaser and rub more. Rinse off this time with warm water, then scrub with soap and warm water. Dry and finally apply Rich's Poison Ivy Splash (see: TIP-ITCH TREATMENT) and rub some more. Do this process immediately upon contact when possible. If you do not have all of these materials on hand, get as close as you can once through, then go get these materials and go through this process as prescribed as soon as possible. If you have discovered it after someone has already been scratching, the process is the same, then you may continue to use the Poison Ivy Splash every 4 hours or more often as needed until symptoms are gone.